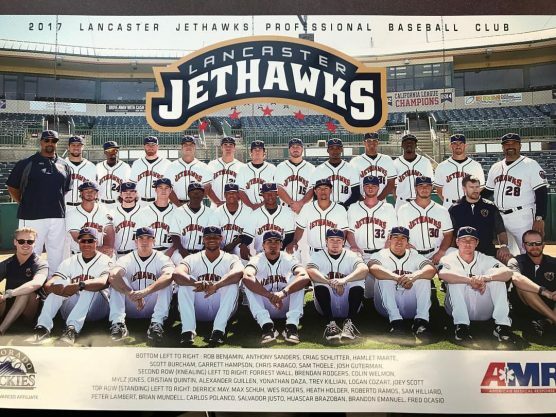 RANCHO CUCAMONGA – Ramon Marcelino carried the JetHawks offense in an 8-4 win over the Rancho Cucamonga Quakes on Friday night at LoanMart Field. The right fielder tripled twice and drove in a season-high four runs in Lancaster’s third-striaght victory. Marcelino’s first triple put the JetHawks (3-6) ahead, 1-0, in the top of the second inning. It was the first of three runs in the frame. Matt Hearn added the last of the three with an RBI-hit. Lancaster chased Quakes (5-4) starter Gerardo Carillo (0-1) in the inning. Luis Castro added a run with a solo shot off Logan Salow in the third inning. The home run was his second of the season and extended his hitting streak to a team-best five games. Lancaster starter Lucas Gilbreath labored and allowed two runs in the third after striking five batters through the first two innings. The lefty returned for the fourth inning but only recorded two outs before being removed from that game. He struck out seven but walked a career-high four batters over 3.2 innings. Moises Ceja (1-0) entered in relief of Gilbreath and eventually earned the victory. He gave up a solo homer to Connor Wong and an unearned run in the fifth but that was all over 2.1 solid innings. He struck out five and did not issue a walk. Marcelino gave the JetHawks breathing room with a three-run triple in the fifth inning, and Hayden Roberts and Tommy Doyle combined to hold Rancho scoreless over the final three frames to finish the win. Lancaster pitchers combined to strike out a season-high 16 batters. JetHawks hitters tied a season-high 17 strikeouts but also drew seven walks in the game. The clubs continue the four-game series on Saturday night in Rancho Cucamonga. Lancaster sends right-hander Antonio Santos to the mound against righty Michael Grove. First pitch is 7:05 p.m.
JetHawks single game tickets, group tickets, ticket packages and season tickets are on sale now. Visit jethawks.com or call (661) 726-5400 for more information.